Luna County was created by an act of the New Mexico Legislature adopted on March 16, 1901. The new County was comprised of the eastern portion of Grant County and the western portion of Doña Ana County. 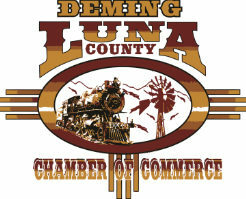 It is said that the impulse to create the county of Luna arose from the intense rivalry between the cities of Deming and Silver City in Grant County. Beginning in 1881 legislation was annually introduced in the Territorial legislature to create a new county and separate the two cities. Finally, the local leaders of the effort secured the support of Don Solomon Luna a prominent Republican politician in the New Mexico Territory, and a successful sheep rancher and banker from Valencia County who took up their cause in Santa Fe. With Mr. Luna’s support, the effort was successful. Logan and Florida were proposed as names for the new county, but when the county was finally created it was named in honor of Solomon Luna whom without his support the effort would not have succeeded. The County is situated in southwest New Mexico and Deming is the County seat. Luna County is a transportation hub with three railroads, an Interstate Highway and an airport with a 6,626 foot long asphalt-surfaced runway. The famous old-West Butterfield Stage Line ran through Luna County. Luna County is the site of the historic completion of the second transcontinental railroad across the United States. The ceremonial silver spike joining the east-bound construction of the Southern Pacific Railroad with the west-bound construction of the Atchison, Topeka & Santa Fe Railroad was driven in Deming on March 9, 1881. Luna County has a population of 25,095 and shares a 54-mile border with the Republic of Mexico. A large modern International Port of Entry located three miles south of the Luna County Village of Columbus on State Highway 11, provides 24-hour per day service between the Mexican State of Chihuahua and the U.S. market for a variety of agricultural products. An international livestock import crossing is located just west of the Port of Entry where more than 80,000 head of cattle are crossed into the U.S. annually. While copper mining and refining have been a primary source of wealth in the surrounding area for most of the twentieth century, Luna County has a proud and successful heritage in farming and ranching producing chilies, pecans, cotton, melons, sweet onions, and grapes and is home to value-added agricultural product processing plants. The value added agricultural processing industry includes Mizkan Americas LLC; St. Clair, New Mexico’s largest winery; and Luna Rossa another award-winning wine maker. Luna County has a place in history as the scene of the last land invasion of the United States when Pancho Villa’s troops crossed the border and looted and burned the Village of Columbus on March 9, 1916. It was from Luna County that General John J. Pershing led the Punitive Expedition into Mexico to hunt for Villa and capture or disperse his band of outlaws. This lead to the U.S. Army to begin their mechanize calvary. Luna County is situated within the northern reach of the Chihuahua Desert, providing outstanding desert landscapes, brilliant sunsets, stunning night skies and embraces several mountain ranges including: Cooke’s Range, the Floridas and the Tres Hermanas. Luna County’s geography makes it an ideal location for production of solar, wind and bio fuels alternative energy.